The first season of The Flash certainly had its ups and downs, but overall, it’s now currently one of my favorite shows. And about halfway through the first season, The Flash did something amazing. It introduced Hartley Rathaway in what was quite possibly one of its better episodes. Hartley, also known as the Pied Piper, is one of Flash’s adversaries, a disabled metahuman with painfully strong super-hearing. Though initially deaf in the comics (something The Flash sadly doesn’t touch on), in both the show and the comics, he eventually gains super-powered hearing. In The Flash, this happens when the particle accelerator explodes and turns him into a metahuman. This ability causes Hartley great amounts of pain, so he creates hearing aids to help mitigate this. He’s also one of DC comic’s few openly gay characters. Since he only appears for all of two episodes, naturally, fanfiction was my solution. It’s In His Kiss takes place after Flash has defeated Hartley and locked him up in the pipeline with all the other evil metahumans. Since Hartley had previously used his hearing aids to escape, Team Flash confiscated those from him and placed him in a padded cell this time around. Hartley, though, won’t go down so easily, and he always has a contingency plan. Using a wire he’d hidden in his glasses, he creates another explosion in order to escape. Unfortunately, without the use of his aids, the explosion and all the other sounds he’s suddenly bombarded with nearly overwhelm him. Despite the pain, he does make his escape. But he doesn’t go far before everything becomes too much. The Flash, obviously, chases after him, and Hartley’s present condition makes him easier to catch once more. And well, as the story summary likes to tell us, the Flash goes about it in a rather unorthodox way. It’s far too much, and all at once, like blunt force trauma directly to his brain. It sets his every nerve on fire—all sizzling, all alight, all registering the pain. He’s resisted the urge to jab a pencil into his ears once before, but this is almost too much. Quite literally, it feels as though his head is about to explode. Distantly, he realizes he can hear someone screaming, although as he collapses to his knees in that lonely little alleyway, vision swimming, it dawns on him that that someone might actually be him. Then suddenly, it’s all over. For the most part, anyhow. He’s still kneeling there in the dead of night with that insistent ringing in his head, but someone’s hands are covering his ears. It’s stupid, really, because it doesn’t block out all the noise, but the sound is muffled under the staccato heartbeat of the owner of those mysterious hands, a sound which grounds Hartley in a way he would never admit to anyone. Scream, that is, because as soon as he draws enough air in between his clenched teeth, he feels too-soft lips pressed up against his own. Not in a demanding sort of way, no…more like a small surrender. 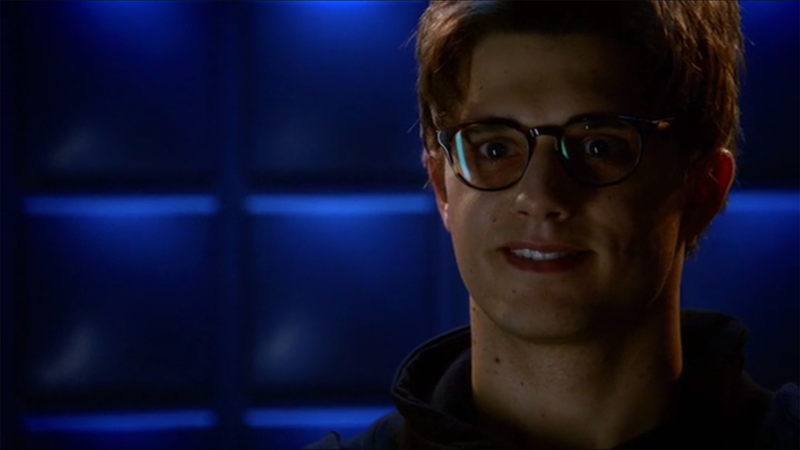 After the kiss, the Flash rushes Hartley back to another padded cell in the pipeline and searches him for more explosives—then the two of them flirt for a little bit. And that’s pretty much it. Initially, when I first read this story, I found myself put off by the kiss. And I will admit that what happens in the story is not the best message to send to readers. 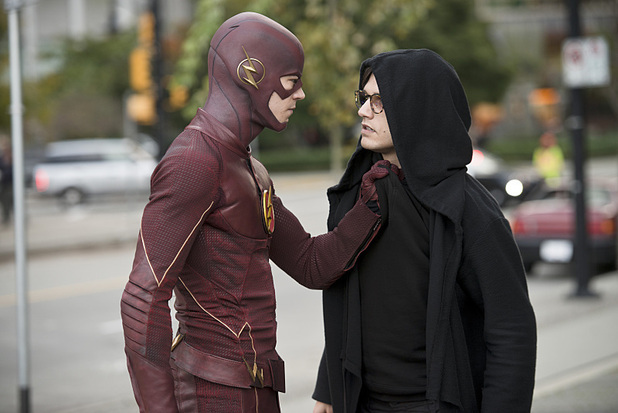 To start, there isn’t really much of a setup for the kiss—in the show, Hartley thanks the Flash for arresting him at one point, since “being scooped up by a guy clad in head-to-toe leather has been a longtime fantasy of [his]”. But the Flash doesn’t reciprocate, and what Hartley says is more mocking than it is flirting. At the end of the day, the two of them still don’t like each other, so the Flash has no reason to think kissing Hartley is appropriate, let alone when Hartley is overcome with pain and clearly doesn’t want him there. So that is something to keep in mind while reading It’s In His Kiss. If you can get around that, this is actually a really good oneshot. It explores the possibility that Hartley and Barry Allen are compatible with each other, while also exploring Hartley’s relationship and thoughts about the other characters. It’s In His Kiss is one of those fics that, like all good oneshots, makes you want to read more. The story is very well written, and for anyone who wants to learn more Hartley’s character a little bit more, you won’t be disappointed. Check it out on AO3 here. This entry was posted in Comics, DC Comics, fanfiction fridays, opinion, Reviews and tagged barry allen, Hartley Rathaway, it's in his kiss, ladyofpride, pied piper, the flash by MadameAce. Bookmark the permalink.